Construction is already underway on Clinton's new 70,000 SF Elementary School. The community of Clinton, Illinois overwhelmingly passed a bond referendum late last year to build a new High School for its Unit School District 15. The Clinton community strongly supported the school district. The referendum passed by a wide margin, with more than 70% of voters favoring the bond proposal. The project includes not only the construction of a new 70,000 square foot elementary school, but also remodeling work at the high school, and demolition of two outdated facilities. A key selling point for the referendum was that it did not raise taxes to pay for repairs or a new building, but simply moved 35 cents of the existing tax rate from the bond fund to the building fund. The referendum issued $16.7 million in bonds for the new building as well as for improvements to the existing high school. School District Superintendent Dr. Jeff Holmes explained that from the beginning, the community wanted to be part of the process, so the Board of Education fully involved the community in planning for the new building. After nine months of open meetings, community residents helped determine the best location for the new school, as well as identify needed improvements for it. 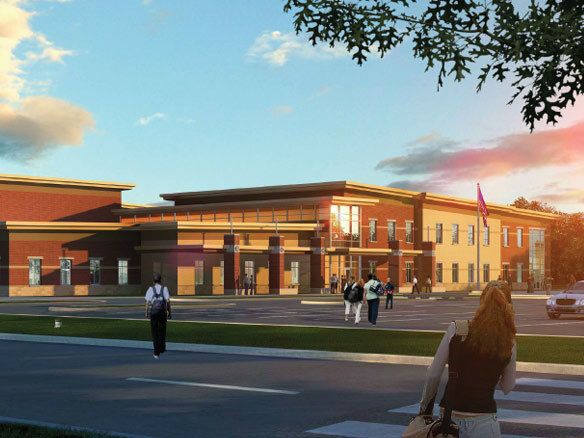 Clinton School District board members chose Cordogan Clark & Associates several years ago to assist the District with the referendum process and design for the new elementary school, following a lengthy selection process that included multiple interviews and sample project visits. CCA was intensively involved with the referendum planning and community building efforts. The firm not only helped lead the community engagement phase of the process, but also participated in going door to door to educate the community on the benefits of what a new elementary school would provide for the community. The referendum had one of the (if not the) highest approval success rates of any capital spending measures on the ballot for that election. Cordogan Clark & Associates promoted the community's involvement through a series of "design charrettes" and preliminary site evaluations that helped document options. This allowed community residents, as informed members of the planning team, to help select the appropriate site for the new elementary school. The planning team is currently working to refine the new elementary program scope through another series of meetings and input from administration and staff. The facility will support 2nd through 5th grade students in their own self-contained classroom wings. The new Elementary School will also function as a community center after hours: Classroom wings can be closed off so that the gymnasium and public areas can be used independently by the community. The design will incorporate Clinton historical elements in common areas, as well as elements from the two outdated facilities scheduled to be demolished. It is also designed to allow for future growth and expansion. For long term savings on heating and cooling costs, the new elementary school features a state-of-the-art geothermal system. The first phase of high school improvements is currently under construction and will be ready for the school year starting August 2014. Site work is progressing and building construction will start later this spring.